Liam Henderson thinks it’s now up to five or six. The number of Hibs fans who’ve had the words of Sky Sports commentator Ian Crocker turned into a tattoo. And that’s just the ones who’ve tweeted him photos. After the Scottish Cup final Henderson went on holiday to Ibiza with Jason Cummings where the pair hooked up with John McGinn. So, come on then: while Gordon Smith, Willie Ormond and others were undoubtedly responsible for some sweetly struck despatches from the flags – and Patrick Callaghan fired over the ball which led to the cup-winning goal in 1902 – what’s the secret of the two most important corner-kicks in Hibee history? “I’ve always fancied myself at dead-balls – I like hitting them,’ says Henderson when we meet in a city centre coffee shop. 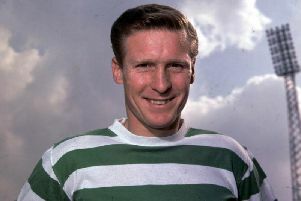 “Every Friday at training the gaffer would say to me: ‘Hendo, go and hit the corners.’ So I’d done that for a full year and against Rangers we knew what we were going to do. Aidan Smith's book, "Persevered", chronicles Hibs' historic Scottish Cup win. “I looked at my point of focus for about four seconds,” he continues, “chipped the ball into my hands and placed it so I’d strike the valve – that helps me get it up and down. Then I flicked my hair behind my ears. The game was frantic at that stage and I have to relax myself to take a good corner and that’s the way I do it. It always annoyed [John] McGinn. ‘You and your hair,’ he’d say. “Myself I love reading about dead-ball technique. How did [Andrea] Pirlo do it? That kind of thing. I’m back at Celtic now so I’ve been asking Scott Sinclair from his time at Chelsea how [Didier] Drogba did it. But a good corner needs a good header and Stokesy produced a great header. You have to remind yourself when you meet Henderson that he only turned 20 a few weeks before the final. You have to remind yourself he was a loan player at Hibs, a role others seem to view as downtime or somewhat beneath them. This is a hugely impressive young man, thoughtful and grateful. Grateful for the chance to play football, for the sacrifices, support and mentoring of others, and to Hibs for giving him “absolutely the best year of my life and one day which, if 24 hours was all I was allowed on this earth, I would happily take”. Henderson, not getting much game time at Celtic, was desperate to come to Leith previously and disappointed a loan couldn’t be worked out. When the idea was revived, he was “intrigued and excited” about the prospect of working with Alan Stubbs, plus there was a strong Hibee tradition in the family. Three generations including dad Nick, who played for Partick Thistle and Hamilton Accies among others, supported the club. A key staging-post on the journey, he says, was the away dressing-room at Tynecastle when the team revved up the Proclaimers on the docking-station, albeit that Sunshine of Leith ended abruptly. After the replay victory Henderson was convinced Hibs would go on and lift the cup, though he never told anyone about his premonition. Henderson knew he wasn’t going to start the final when four weeks before he’d been left out of the final league game against Rangers as Stubbs stuck to his preferred back-three to combat the Ibrox side. “I was disappointed but I spoke to my dad who told me to stay positive and be a good team-mate. I think I was that because earlier in the season when I wasn’t picked a couple of times I went in the huff. So what about the last remaining seconds when he seemed to position himself as close as possible to the referee to receive first intimation of full-time with the blast of the whistle before beginning his mad gallop across the park – was that deliberate? Henderson thinks the post-final party lasted six days although it might have been even longer. “I remember Fonz saying: ‘That’s us meeting up pretty much every year around this time for ever now.’ It’s a bond for life and that’s a great, great thing.